Deskriptive Anatomie der Zähne u... Rufenacht, Claude R.
Grundsätze der ästhetischen Inte... Goldstein, Ronald E.
This clinically oriented textbook explores medical microbiology and immunology as they relate to the practice of dentistry, including sections on the microbiologic basis of caries, periodontal disease, and endodontic infection. The book begins with a thorough discussion of immunology and then systematically covers the bacteria, fungi, viruses, and parasites that affect the human body as well as their oral manifestations. Exremely detailed illustrations throughout aid the reader in comprehending the complex interactions involved in processes such as cellular immunity, bacterial and fungal infiltration, biofilm and dental plaque formation, and virus entry and replication. Sections on recombinant DNA technology, molecular diagnostics, and genomics familiarize the reader with new technologies and emerging fields that will impact future practice. Notable discoveries in molecular biology are highlighted throughout, and research questions are featured as well to engage understanding and critical thinking. Finally, an appendix of cases in medical microbiology challenges the reader to pose diagnoses based on clinical symptoms. 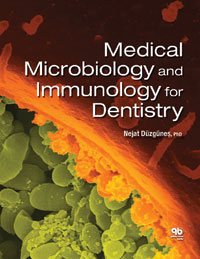 This book will no doubt become the definitive textbook on microbiology for dental students and dentists.